Like many vegetables, cucumbers are very different tasting when you grow them yourself. Growing cucumbers in containers is easy and hugely rewarding, but there are a few things that are helpful to know. As is true with most vegetables and fruits, bigger is much better when choosing your container. Bigger pots hold more potting soil, which in turn retains water longer. Cucumbers depend on access to a lot of water to grow, so you want to make sure they get a consistent level moisture. If you only have a little soil, that is much harder to do. One great container for growing cucumbers is an Earthbox or another self-watering container. It's also possible to grow cucumbers in a straw bale garden. Your cucumber container garden will need at least 6 to 8 hours of full sun. In my experience, almost everyone overestimates how much sun an area gets, so it pays to really figure out how much direct sun an area gets before you plant there. Either use a sun calculator or get out your watch and time how many hours the sun is hitting an area. Use a good quality potting mix or potting soil or container mix. I use organic potting soil and prefer a soil that does not have fertilizer or wetting agents added. If your potting soil has premixed fertilizer, you don’t want to add more. If your potting soil doesn’t have fertilizer, you will want to mix in an all-purpose fertilizer before you plant your cucumbers. Cucumbers are heavy feeders. Its helpful to add a slow-release, all-purpose fertilizer into the potting soil before planting and then use a diluted, liquid fish emulsion, seaweed combination, once, every other week during the growing season. If you are growing them in an Earthbox, follow the directions and use the organic fertilizer that comes with them. Cucumbers need warm soil to thrive and grow. They grow best from around 70°F to 95°F. That means cucumbers should be planted in containers after the soil temperatures are at least 70°F. Depending on how protected they are and what material your pot is made of, you may have to wait around two weeks after the last frost. Some pots will heat up more quickly. Black plastic pots or Earthboxes, which use a soil cover, retain heat, so will reach the desired temps sooner than other materials. Cucumbers are very easy to start from seed in a container. However, if you live in a cold climate and want to get a jump on the season, you can start them inside. To make sure they get enough light, put them under shop lights with one warm and one cool bulb. Cucumbers have fairly large seeds so should be planted about 1/2 to 1” deep. If you are growing seeds inside, be very careful when transplanting – cucumbers can be a little temperamental about this. First, make sure to harden off your seedlings. Then when transplanting them, be very delicate as they don't like their roots messed with too much. You should plan on one or two cucumber plants per square foot of potting soil. If you are planting seeds or seedlings in an Earthbox or another brand of grow box, plant only 4 seedlings per box. There are several reasons to trellis your cucumbers. First, if they are sprawling all over the ground - and most varieties of cucumber will sprawl like crazy - the cucumbers get dirty and often get chomped on by critters. Also, if you grow them on a trellis, they are easier to find and then harvest. Also, depending on your set-up, plants are on a trellis can give leaves more exposure to the sun, which is a good thing. Make sure you have a sturdy trellis. Remember that once the trellis is covered with cucumber vines, it has a lot of wind resistance. Make sure your container is in a very protected spot if you are trellising and make sure that it won’t blow over if there is wind. The success of cucumbers depends on consistent and ample watering. Make sure the soil stays moist, not wet. Check this by sticking your finger up to the second knuckle into the soil. If the soil is moist at your fingertip, wait to water. If it is dry, add water very slowly, until it flows out of the drainage hole at the bottom of your container. Make sure the soil is actually absorbing the water. If the soil is very dry, it can shrink away from the walls of your pot and when you go to water, it escapes before it can wet the soil. Cucumbers can grow ridiculously fast. They can go from tiny to enormous in just a few days. Almost all cucumbers get bitter and seedy as they become overripe, so make sure to check your plants often for ripe cucumbers. Many varieties can be picked small, and some are tastiest when they are petite. Check your plant tag or seed packet to find out the optimal size for harvest. Use a garden clipper or scissors to harvest cukes. If you pull them off, you risk damaging the vine, which can easily break. Harvest often, because the more you harvest the more you will have. Even if a cucumber is damaged or too big, take it off. There are two main types of cucumbers, bush, and vining. 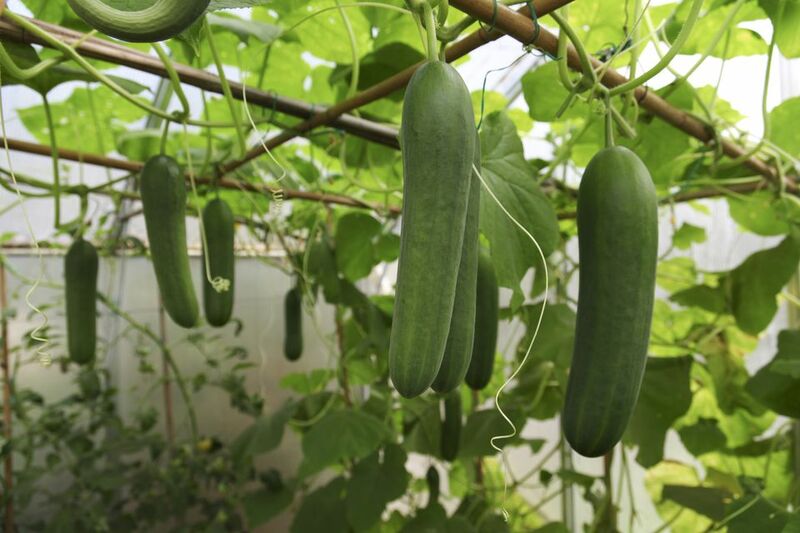 Bush cucumbers tend to be shorter and more compact and have smaller yields. To increase your harvest, and extend your season, try planting bush varieties in succession – planting every two weeks or every month. Before you do this, make sure to find out how many days it will take for your particular varieties to be ready for harvest. Diva: It is parthenocarpic, so does not need to be pollinated. It is delicious, a great producer, disease resistant and has foliage that isn't attractive to cucumber beetles. 58 days to maturity. Lemon Cucumber: This cucumber is small and yellow, sweet and round. Good for eating or pickling. It has a pretty long maturity time of 65 days. Northern Pickling: Small sweet cucumbers that grow on short vines. Very short time to maturity at 48 days so is good for late season planting.